This week, in a land where Jewish culture once flowered, people are joining together to remember Jewish lives lost in the Holocaust. The week of September 21, officially designated as the "Days of Remembrance of the Genocide of Lithuanian Jews," marks the 72nd anniversary of the liquidation of the Vilna ghetto. In cities and towns in every corner of this Baltic country, residents are invited to remember those who perished in the Holocaust in a uniquely personal way - one by one, name by name. Commemorative events will take place not only in the capital city of Vilnius, but also in small towns throughout the country, including Jonava, Jurbarkas, Moletai, and Sveksna. Many of the events come at the initiative of an informal group known as "Vardai," or "Names." In each locale, members of the public are invited to take a turn reading aloud from a list of onetime Jewish residents. As people step forward to utter the names and professions of Jews who once called Lithuania home, they are spurred to feel both a presence and an absence. They are put in contact both with the vibrant Jewish culture that was once woven into the fabric of daily life in Lithuania, and with the gaping void left behind by the Shoah. "This is our history, our memory. When one whispers the names and professions of the people who lived here, one can no longer forget." "These readings bring us nearer to the historical truth that cannot be hidden or distorted." 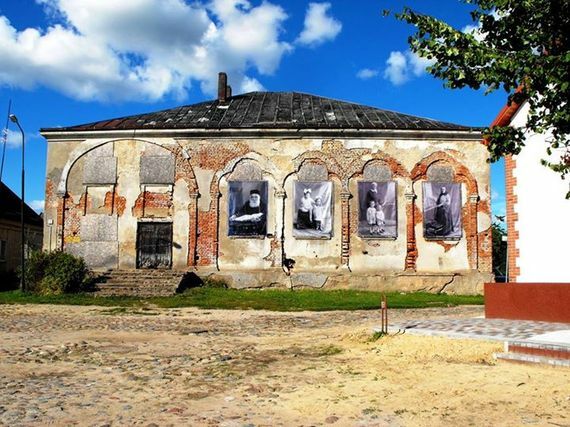 In Vilnius and in Sveksna, enlarged photographs of former Jewish residents have been affixed to the outside walls of Jewish historic sites - a former synagogue, a former library. The faces, in all their particularity, take the place of cold, dry numbers. They are a potent and personal reminder of those who were once among us and are no more. For centuries, throughout Lithuania, Jews and their non-Jewish neighbors lived side by side relatively peaceably. But during World War II, a place of relative harmony became a land of ghettos and mass murder. German forces with the assistance of some Lithuanians annihilated the vast majority of the nation's Jews - including some of my own relatives. By the end of the war, only 6 percent of Lithuania's 240,000 Jews remained alive. In the major cities, tens of thousands of Jews were imprisoned in ghettos. The Vilna ghetto was liquidated on September 23-24, 1943. Thousands of ghetto residents were sent to concentration camps in Poland, Estonia, and Latvia. Others were sent to the killing site at Ponar. Some partisan fighters escaped to the forests. Only a tiny fraction of the ghetto population survived. "All that is left is walls, roofs, pillars, cornices, tottering beams. All that is left are broken iron bedsteads, the rusty entrails of Primus stoves, twisted forks, knives, spoons - without the mouths. And I am left with eyes without tears, like window holes with neither frames nor glass." During the nearly half-century of Soviet rule that followed the war, few expressions of Jewish culture were permitted. Lithuania's historic Jewish heritage was mostly invisible. The reality of the Holocaust went underground. In the 1970's, when Jews were permitted to emigrate, Jewish culture slipped even further out of sight. From a postwar peak of about 25,000, the Jewish population steeply declined. Today it is about 4,000. But as Lithuanian independence began to dawn at the end of the 1980's, the leaders of Sajudis, the Lithuanian independence movement, believed it was essential to bring Jewish history, including the Holocaust, out of the shadows. Re-incorporating Jewish history into the national narrative, they declared, was an important element in building the new nation. As part of the effort to build a new civil society, Jews and non-Jews in Lithuania began working to create a new public discourse. Through educational curricula, museum exhibitions, plaques, cultural events, and more, Lithuanians today have the opportunity to touch the nearly-vanished Jewish world and to reflect on the destruction. Lithuania's efforts to engage with the realities of the Holocaust are fragile. Jewish cemeteries and communal buildings are periodically desecrated. Prejudice explodes on Internet sites. Neo-Nazis parade through the center of town every spring. The government, and individual officials, are rightly criticized for actions and inactions that fall short of respectfully embracing the lessons of the past. The reading of Jewish names this week, however, is one powerful way that Lithuanians are finding to remember, to mourn, and to connect.